Yesterday I noticed the enormous pile of wheat developing beside Louis Dreyfus terminal just south of Tisdale. This terminal also had a huge pile of wheat on this site last year. 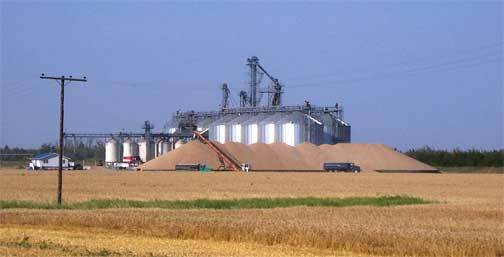 What surprised me was that no other grain terminal in the area is receiving deliveries of wheat at this time. I drove by Harvest Valley this morning and it was a pretty quiet place. The pile of wheat that you see in these pictures is around 300,000 bushels of wheat and from close observation this morning it appears to be outstanding quality. It sort of identifies the size of the problem facing Saskatchewan farmers. The price of wheat last year was as low as 32¢ a bushel and this year's crop will sell for something between $4 and $5. 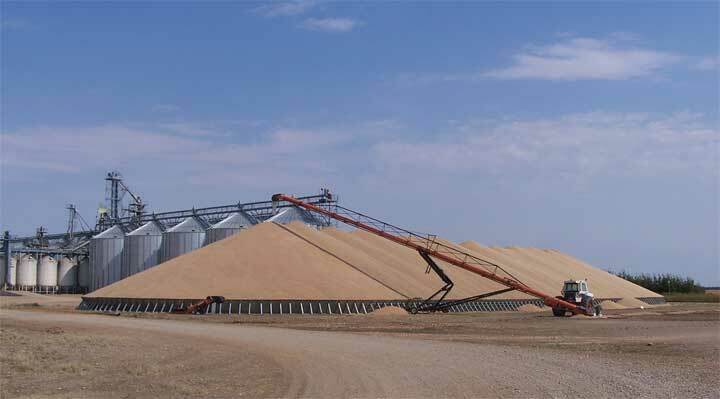 With the size of that pile of grain it is still only worth at the most perhaps one and half million dollars. Just so you get the idea of the value of things that pile of wheat were it gasoline would be around eighteen million litres and at today's retail price in Tisdale ($1.07.9/litre) that would be worth $19,422,000. That same wheat pile would produce about 18,000,000 loaves of bread or about $36,000,000 in retail value. I asked a farmer today what are the yields like and he said that in his area the quality was just excellent but because of the flooding at seed time the fields are not even in their production resulting in low yields.